"The important thing is that you feel companionship," said Hilary Isaac during a discussion on pets on Friday's Solar Daybreak. Those exact words might also apply to the Sunny Network's morning show as the week started with Isaac joining Claire Celdran as her newest co-host. 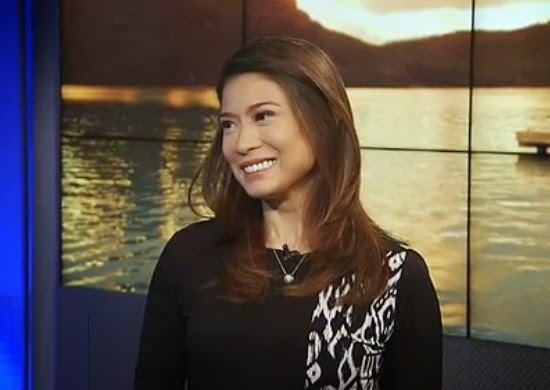 With no announcements or hints of transition, the powers that be at Solar News quietly installed the telegenic radio DJ turned news anchor as permanent replacement for Amelyn Veloso, who is now anchoring her own two-hour public service program Serbisyo All Access. What's commendable about Celdran and Veloso is that their partnership seems genuine and that they like each other. Aside from that, they never try to outshine one another. It's always a give-and take-scenario whenever they conduct studio interviews and when they do banters. It's like seeing Amelyn as the older sister with all the wisdom and experience, and Claire as the younger sister with that impressive track record and hunger for quality journalism. Chemistry is what fuels the show, and they clearly found the right tandem with these two. It will be fascinating to watch if the Celdran and Isaac tandem will establish any sort of rhythm in the days and weeks to come. All eyes will surely be on Ms. Isaac, the former co-anchor of Solar Nightly News, to see if she can be as warm and affable as Ms. Veloso, and if she can flex her muscles doing the news and conducting interviews in early morning hours. Will her entry on Solar Daybreak be a reprise of her stint on Solar Nightly News? Can she breathe new life into the show? It's too early to tell. All I can say is that viewers SHOULD start giving her a second look even though Amelyn is just a tough act to follow. What do you think of Hilary Isaac's inclusion on the show? Let us know what you think by posting your comments below or on our Facebook page. You can also tweet us @medianewserphil.